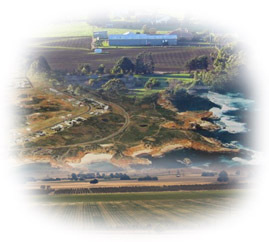 Corangamite Land Use This map provides an overview of land use across the Corangamite region and has been generalised from more detailed mapping completed as part of the South-West Land Use Mapping project. The procedure used to develop the South-West Land Use Map balanced the need for reliable data, practicality and cost effectiveness. Mapping scales depended on land use intensity and range between 1:25 000 and 1:100 000. The South-West Land Use map was produced through a series of steps. The first step was to combine accurate digital data sources describing land use (such as the public land management layer) with the state cadastre. This formed a draft land use atlas. The gaps in the draft atlas were then filled by desktop interpretation of aerial photos, roadside inspection of land use and supervised classification of satellite imagery. Each homogeneous polygon in the cadastre was assigned a class in the Australian Land Use and Management Classification scheme. At the time of classification the data source, its date and accuracy were noted in the map attribute table. This means that the land use map does not describe the land use at one moment in time but over a range of dates in 2000 and 2001. An interactive mapping application for land use mapping is available on the Federal Department of Agriculture, Fisheries and Forestry website (external link). This allows you to interactively view and print more detailed land use mapping for much of Victoria. This map shows the location of State and National Parks in the Corangamite region, and in nearby regions (as at January 2006). Parks Victoria manages Victoria's world class network of national, state, regional and metropolitan parks, other conservation reserves, many significant cultural assets, and Melbourne's bays and major waterways. The Parks Victoria Parkweb website provides information about each of Victoria's National and State Parks. A large contribution to the technical method development and implementation of land use mapping in Victoria has been made by the staff of the former DPI's PIRVic from the Tatura and Werribee Centres. Many hours of field work, GIS editing and field validation were undertaken by staff from DPI's Werribee Centre for the South West Land Use Mapping Project. For further details contact Elizabeth Morse-McNabb. Landuse information on the Statewide VRO website.